Digicel is a mobile phone network provider operating in 33 markets across the Caribbean, Central America, and Oceania regions. The company is owned by the Irish billionaire Denis O'Brien, is incorporated in Bermuda, and based in Jamaica. It has about 14 million wireless users. Digicel is present in Anguilla, Antigua and Barbuda, Aruba, Barbados, Bermuda, Bonaire, the British Virgin Islands, the Cayman Islands, Curaçao, Dominica, El Salvador, Fiji, French Guiana, Grenada, Guadeloupe, Montserrat, Guyana, Haiti, Jamaica, Martinique, Nauru, Panama, Papua New Guinea, Samoa, Saint Kitts and Nevis, Saint Lucia, Saint Martin and Saint Barth, Saint Vincent and the Grenadines, Suriname, Tonga, Trinidad & Tobago, Turks and Caicos, and Vanuatu. Wireless service in the Caribbean had been under the control of the large British company Cable & Wireless, the longtime provider of telecommunications services in the region. Cable & Wireless had little competition or incentive to change, and wireless service was considered expensive and poor in quality by Caribbean customers. In 2001, however, Jamaica decided to open its phone market up for competition. Digicel, owned by Irish entrepreneur Denis O'Brien, first established itself in April 2001 in Jamaica. It grew to 100,000 customers there in approximately 100 days. In the ten years since the initial launch, Digicel's Jamaican customer base has grown to over two million users. The company has a market share of over 70% in Jamaica. In Haiti, where they launched operations in May 2006, the company now has 2.4 million customers making Haiti Digicel's largest customer base to date. The majority of Digicel networks started up in countries where the telecommunications market had been newly liberalised. As a result, there have been numerous rows between Digicel executives and former state incumbent operators over interconnect agreements. This has led to Digicel taking some incumbent operators to court. In 2006, Digicel expanded into the Central American mainland as well as the Pacific. On September 2006, Digicel acquired an unrelated mobile phone provider Digicel Holdings in El Salvador, rebranding it as El Nuevo Digicel. Digicel El Salvador has now overtaken Claro as number two operator in the country. In December 2007, Digicel won a highly competitive bid for a mobile license in Honduras and Digicel won a licence to operate in Panama in May 2008. Digicel launched in Honduras and the British Virgin Islands in November 2008 and in Panama in December 2008. In 2007, Digicel also expanded their presence in South America and in the country of Guyana, acquiring U*Mobile, now rebranded as Digicel Guyana Ltd as well as launching in Suriname in December 2007 and French Guiana in June 2006. In February 2011, Digicel took a controlling stake in Netxar Technologies, the leading systems integrator in the Caribbean region. Digicel also has coverage in St. Martin and St. Barts in the Caribbean. In March 2011, Digicel sold its operations in Honduras and El Salvador to Mexican telecom giant America Movil, in turn America Movil sold all of its operations in Jamaica to Digicel. The latter actions strengthened America Movil's dominance of the Latin American market, while Digicel strengthened its hold on its domestic market. In March 2012, Digicel made the acquisition of Comcel / Voila, its main competitor in Haiti, for $97 million. The company's largest competitor in the Caribbean region is FLOW, an outgrowth of Cable & Wireless and Liberty Global. In Latin America, their largest competitors are Claro Americas, part of América Móvil, Movistar and Tigo. Digicel announced that it would invest $9 billion in a mobile phone network in Myanmar, which has virtually no telephone infrastructure. Digicel plans to have 96 percent coverage in Myanmar by the end of 2015. However, Digicel lost the bid to Telenor and Ooredoo to get license in Myanmar. In 2006, Digicel expanded into the Pacific. Digicel's sister operation in the Pacific Islands region operates in Samoa and in Papua New Guinea running at 900 MHz GSM with GPRS & Edge data services and in PNG Digicel is now rolling out 3G UMTS/HSPA+ also data services, also via 900 MHz, Vanuatu, Tonga, Fiji, Nauru as well as an experimental license in the Solomon Islands and Tahiti. An outdoor Digicel ad on a bus shelter in Tonga. Digicel Fiji on 3 November 2010 changed its logo with a shade of blue in the last letters "cel". The blue colour represents the background colour of the Fiji flag and coincided with Digicel Fiji's new ad campaign slogan "Fiji Matters To Us". Digicel Mobile Money launched in Fiji in July 2010 with subsequent deployments in Tonga (January 2011), Samoa (March 2011), Vanuatu (July 2011) and Nauru and Papua New Guinea in progress. In Vanuatu, similar to other countries, Digicel reduced the cost of mobile phone ownership dramatically making it available to a much larger number of the population. At launch the cost of a phone was 500 vatu compared to the over 1,000 vatu for the incumbent operator Telecom Vanuatu Limited with its Smile network. In addition, Digicel was the first to deploy mobile money services in these countries creating an ecosystem of agents that includes the main commercial banks ANZ Bank, BSP, Westpac, National Bank Vanuatu as well as key money movers such as PostFiji and VanuatuPost. The service has been supported by The Pacific Financial Inclusion Program, AusAid and GSM Association's Mobile Money for the Unbanked initiative. Attempts by the Jamaican telecoms regulator, the Office of Utilities Regulation (OUR), to regulate the Jamaican telecoms market resulted in a drawn-out court battle with Digicel, throughout the 2000s. In April 2002, Phillip Paulwell, the then Jamaican minister of industry, commerce and technology, in response to a complaint from Digicel, instructed the OUR to refrain from interfering with the pricing policies of Digicel. At the time, Digicel had been charging Cable and Wireless an interconnectivity fee each time Cable and Wireless customers called into Digicel's network that was higher than the top fee established by the OUR. The OUR thus instructed Digicel to price its service accordingly. Following a judicial review, it was ruled that Paulwell had no power to issue the directive to the OUR. However, in 2003, Digicel took the case to Jamaica's Supreme Court and won, though the OUR subsequently appealed the ruling to the appellate court. The Court of Appeal ruled that Paulwell's directive was outside his ministerial powers and invalid, and the OUR had no obligation to comply with it. Digicel then again appealed the ruling by taking the matter to the Privy Council, Jamaica's final court of appeal, though it proved unsuccessful after the Privy Council, upholding the decision of the Court of Appeal, again ruled that Paulwell's directive was ultra vires and that OUR had been correct in ignoring him. The judgement also meant LIME (formerly Cable & Wireless Jamaica) was allowed to keep the £22 million Digicel had earlier been ordered by the Jamaican courts to pay LIME for termination rates in respect of incoming calls. Paulwell's integrity was also questioned in 2011 when it emerged via WikiLeaks that U.S. officials based in Kingston, Jamaica's capital, had described him as a "conflicted and meddling" minister. The diplomatic cable, dispatched in 2007, detailed Paulwell's alleged mismanagement of the Universal Access Fund, which was set up by the United States Federal Communications Commission in 1997 to meet Congressional universal service goals as mandated by the Telecommunications Act of 1996. It also documented how he had paid attorney Minette Palmer, his former personal advisor, almost USD $450,000 over a 19-month period, despite that no internet facilities had been provided in schools during that time as the scheme intended. To further compound matter was the revelation that Mr. Paulwell had recently awarded a cellular licence to a company controlled by Ms. Palmer and her husband. In 2012, Digicel's Jamaican offices were raided by the Tax Administration of Jamaica (TAJ) as part of the tax administration's exercise of auditing various sectors of the Jamaican economy, including all companies in the telecoms sector. A high-profile public debate broke out after the TAJ was forced to resort to the courts to secure information about Digicel that the TAJ had requested. At the same time, the TAJ also denied media reports that a tax assessment had been served on Digicel, and stressed that the TAJ had not provided any figures indicating tax owed by Digicel. However, Digicel filed an affidavit to the Jamaican Supreme Court stating that the TAJ had asserted that there was a $1.26 billion discrepancy in the numbers it had calculated and the amount Digicel had included in its GCT (general consumption tax) returns, but that it was "now abundantly clear that TAJ completely misunderstood the data it been provided with and – rather than seeking clarity – it arrived at its own grossly inaccurate conclusions". The Jamaican Ministry of Finance and Planning hit back saying that it had received significant technical assistance from multilateral agencies, as well as international bilateral assistance. The TAJ accused Digicel of making "unfortunate" and "misleading" accusations against the tax administration, and said it would not be deterred from its auditing exercise as it had "irrefutable proof" of considerable revenue leakage taking place in Jamaica. Volunteers from Digicel distributed several tons of food to Haitian citizens in Port-au-Prince, in a distribution sponsored by the Agency for Technical Cooperation and Development following the devastating 2010 Haiti earthquake. Digicel is a leading sponsor of Caribbean, Central American and Asia-Pacific sports teams, including the Special Olympics teams throughout these regions. Digicel sponsors The West Indies cricket team. It was the title sponsor of the Digicel Caribbean Cup during 2005, 2007, 2008, and 2010. It also sponsors the Cayman Islands Digicel Cup in football, starting in 2006. Digicel sponsors the highest level of football in Trinidad & Tobago, the TT Pro League, known for sponsorship reasons as "The Digicel Pro League". In the Pacific, Digicel is the sponsor of several national rugby teams and also sponsors the Vanuatu national cricket team. It is the sponsor of the Digicel Cup for rugby in Fiji. It also sponsors Taça Digicel, the second top division of the Federaçao Futebol Timor-Leste. In April they were announced as the first global sponsor of the 2013 inaugural tournament for the Caribbean Premier League. This multi-year deal follows their strategy for supporting cricket and other sporting events in the Caribbean. "The CPL is a perfect fit for Digicel. We're huge fans of West Indies cricket and this is a great opportunity for us to invest not only in what will be an amazing event, but also in the young cricketers who will benefit from around the region", stated Digicel Group Marketing Operations Director Kieran Foley. "Having seen all the plans for the inaugural tournament, we know the CPL will be a spectacle like nothing else seen in the region and we are looking forward to being front and centre of the action." Digicel and its shareholders also set up a foundation that has been actively involved in charitable work throughout the Caribbean involving a wide range of school and sports projects as well as providing some J$200 million in assistance after Hurricane Ivan devastated many of the islands, especially Grenada and the Cayman Islands. To date the Digicel Foundation in Jamaica has allocated US$7 million to sustainable development community projects in the country. In Haiti the Digicel Foundation built 20 primary schools in its first year. Digicel promised $5 million in aid to Haiti after the catastrophic 2010 Haiti earthquake struck Port-au-Prince on January 12, 2010. The company has been responsible for several major commitments to re-building Haiti, including the restoration of the historic Iron Market and a commitment to build a new hotel to further encourage economic growth in the capital. The following is a list of Digicel Group's Asia Pacific operations. These operations are headed by an office in Port Moresby, Papua New Guinea as well as one in Singapore. The following is a list of the North Atlantic, Caribbean and Central American operations of Digicel Group. All report to Digicel Group's headquarters in Kingston, Jamaica. In 2018, the company launched Digicel Sports, initially launching in El Salvador, Panama, Haiti and Jamaica. ^ a b Cauley, Leslie (27 August 2006). "Digicel makes cellphone connection in Jamaica". USA Today. ^ "DIGICEL ACQUIRES NETXAR TECHNOLOGIES - DIGICEL ACQUIRES NETXAR TECHNOLOGIES". digicelgroup.com. Retrieved 16 February 2015. ^ Maierbrugger, Arno (5 June 2013). "Digicel and Soros pledge $9b for Myanmar". Inside Investor. Retrieved 5 June 2013. ^ "Digicel loses out to Norwegian, Quatari telecoms in Myanmar bid - Business". Jamaica Observer. Retrieved 16 February 2015. ^ "Welcome to Digicel Mobile Money". Retrieved July 17, 2011. ^ "Mobile Money for the Unbanked". GSM World. Archived from the original on July 16, 2011. Retrieved July 17, 2011. 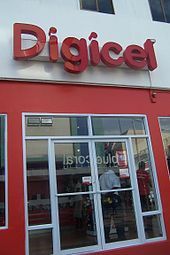 ^ a b c "Blow to Digicel". Jamaica Observer. Jamaica. 22 January 2010. Archived from the original on 2015-03-05. ^ "KCOB Lawyers Score Major Victory in Privy Council". KC Times. Jamaica. March 2010. Archived from the original on 2013-10-14. ^ a b c "WIKILEAKS - Paulwell's Nine Lives". The Gleaner. Jamaica. 5 June 2011. ^ "Jamaica: Universal Access Fund - A Meddling Minister And Issues Of Conflict". Jamaica: CableGateSearch. 23 July 2007. ^ a b c d Hall, Arthur (May 10, 2012). "Gov't Defends Digicel Tax Raid". Jamaica Gleaner. ^ "Digicel Cricket / News / Digicel Announced as Major Sponsor for Caribbean Premier League". digicelcricket.com. Archived from the original on 16 February 2015. Retrieved 16 February 2015. ^ "Latest News". cplt20.com. Retrieved 16 February 2015. ^ "Our Mission". Digicel Foundation. Retrieved 6 January 2013. ^ "Welcome to Grenada's first super-fast LTE network". www.digicelgroup.com. Retrieved 2018-12-04. ^ "Welcome to St Lucia's only island-wide LTE network". www.digicelgroup.com. Retrieved 2018-11-04. ^ "Welcome to St Vincent and the Grenadines 1st & only LTE network". www.digicelgroup.com. Retrieved 2018-12-03. This page was last edited on 3 April 2019, at 14:03 (UTC).